She is a beautiful dog! I also crochet, sew, etc, etc. There are several on here who crochet and maybe 1 or 2 that knit. Your babies names are so pretty! How are you 46, @aclovly? Lol You do not look like you would have grandchildren! Sounds like a Harry Potter thing. I’m Lisa and my nursery name is Amarantine Babies. I’ve been reborning for a year and a half about, and I love it! My Facebook page is www.facebook.com/amarantinebabies and my website is www.amarantinebabies.com. I’m going to ROSE for this first time this year and I am so excited! Everyone on here seems so lovely. It is wonderful.getting to know a little bit about everyone. You are all so beautiful! Hufflepuff and Slytherin are school houses the students are sorted into in the Harry Potter series. Hufflepuffs are friendly, hard working,and generally well liked. Slytherins are ambitious, sly, and cruel. As a fellow Slytherin, I’m going to dispute your description of “cruel”. Cold would be more accurate. Slytherins often get a bad rap because they aligned themselves with Voldemort in the HP books but honestly that is because they tend to have strong senses of self-preservation. Look at poor Draco, who as a child was ‘dark’ because that’s what his parents thought the winning side would be, but as his father and then himself failed to please Voldemort and lost everything, became less and less interested in being on the ‘dark side’ and more and more interested in being on whichever side won. Turns out Draco is a coward, but one who loves his friends (crying when Crabbe dies), loves his parents (running around at the battle looking for them), and loves his family (his wife and son Scorpio). Sorry for the long post, I just get all worked up over Slytherin is bad stuff lol. Honestly, I’ve taken the Pottermore test twice; once when the site was like two days old and the second more recently after all the test has been updated. First time I got Slytherin, second time I got Gryffindor. But in the time between I became a very loyal Slytherin haha. I got Great Grey Owl! They had to ask me extra questions so I think it’s a less common patrons! Lol, we are hijacking this thread with our HP love! Hello, I’m Maddie, I live in Austin, Texas! I haven’t painted any dolls yet but once I have some time it’s gonna happen because I already have too many kits! I’m super hands-on, sewing, knitting, beading, learning to smock, I can weave, drawing, etc. Mostly sewing. 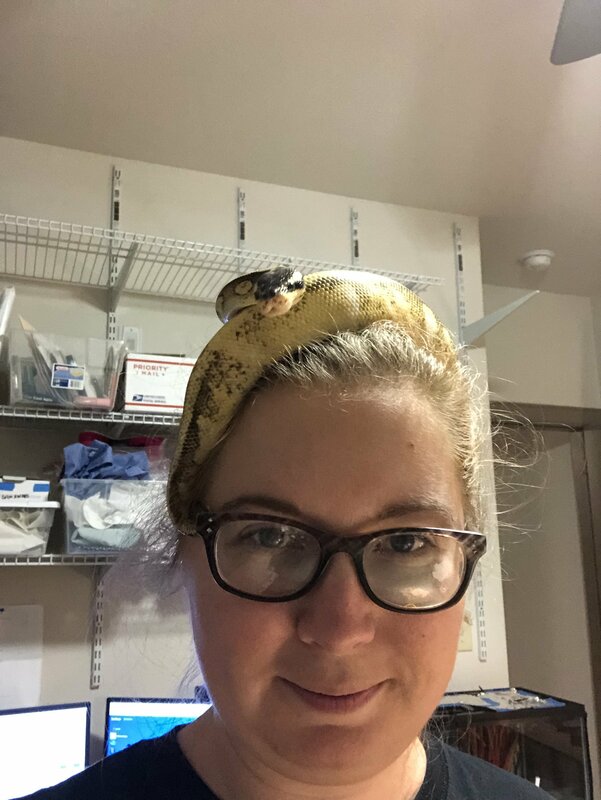 Here’s an appropriate picture of me wearing my ball python Fluffy (one of four) while doing some sewing. Howdy neighbor, I’m in Cleveland Ohio.